I’m blogging today at Lou Sylvre’s Authors Speak about co-authoring with Lou. There’s also a raw sneak peek of our novella in progress Sunset at Pencarrow. You can read the post and the snippet here. I’m hosting Deja Black today on my LJ as part of her blog tour with April Kelley for They Called Him Nightmare from Dreamspinner Press. 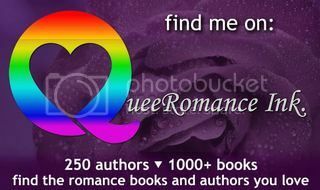 I’m hosting the authors of A More Perfect Union anthology from Dreamspinner Press today on my LJ. I’m hosting Bronwyn Heeley today on my LJ as part of her blog tour with April Kelley for Taking a Stand. There’s also a rafflecopter giveaway. I’m hosting the authors of the Collars ‘N’ Cuffs Anthology from Wayward Ink Publishing on my LJ today as part of their blog tour with Eyes on Books. There’s also a rafflecopter giveaway. I’m hosting Grein Murray today on my LJ as part of her blog tour with Creative Minds Promotions for Chaos and Hype. There’s also a rafflecopter giveaway. I’m hosting J.T. Cheyanne today on my LJ for her blog tour with Eyes on Books for Collateral Damage. There’s also a rafflecopter giveaway. I’m hosting A.L. Bates on my LJ today as part of her blog tour with Eyes on Books for Blood Lines from Wayward Ink Publishing. There’s also a rafflecopter giveaway.